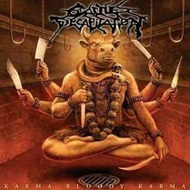 CATTLE DECAPITATION's 2004 release, "Humanure", was a gigantic step forward from the one-dimensional goregrind of "To Serve Man" in terms of arrangement dynamics and a decidedly more death metal approach. With "Karma.Bloody.Karma", the vegetarian quartet stretches things a bit further, adding even more experimentation. A dark Billy Anderson production, Josh Elmore's amazing guitar acrobatics, and Travis Ryan's incorporation of black metal shrieks to go with his unique growl, and the controlled chaos of the compositions make "Karma.Bloody.Karma" stand out from the pack of standard death metal and grindcore releases. Together with explosions of calamitous grind and punishing death metal, CATTLE DECAPITATION twists and turns its way through 12 tracks of structured technical lunacy, as Ryan rages against humanity's continuing degradation of the earth and its peoples. But it keeps coming back to Elmore's guitar work. His style is extraordinarily technical, yet it is far from pointless wankery. Melodic flourishes are met with spiraling solos and sweeps, always ensuring that the core riffs never derail the basic song structures. Together with drummer Michael Laughlin's spastic approach and Troy Oftedal's equally free flowing bass, the initial spin of the disc is overwhelming in its intensity, requiring one to take a break and dive back in to discover new layers with every play. Melody is present amidst the maelstrom, as "The Carcass Derrick" and especially "Total Gore?" (with guest vocals from THE LOCUST's Joey Karam) demonstrate. The tunes will often feel as the though the vehicle may careen off a cliff at any moment, and then a swift and steady gallop on a track like "Unintelligent Design" allows for a regaining of control. On "Success is… (Hanging by the Neck)" you'll hear epic, quasi-black metal riffing, then dark and airy sections on "Suspended in Coprolite", the latter another highlight, based on the memorable vocal patterns. Swirling guitar madness abounds on "The Carcass Derrick", but here again the band reigns it in briefly enough on the "chorus" to ensure a lasting impact. Moments of airy drone are heard during the last three minutes of "Alone at the Landfill", a song that has Anderson, Elmore, and Oftedal (who also adds a bit of piano) contributing vocals. Strange whirring and background screams are also heard for the duration of album-closer "Of Pride & Human Flatulence", the electronic effects on this song and the album as a whole provided by John Wiese of SUNNO))) fame. Ryan and Elmore are credited with E-bow on the track. The album's busy arrangements and numerous teeth-rattling moments will be a bit too much for some. Everyone else will find "Karma.Bloody.Karma" to be a true extreme metal gem with intelligent lyrics and phenomenal performances.